Principal permanent secretary Mario Cutajar (photo) is not bothered by the widespread unconstitutional practice that is taking place in the public service under his watch, where hundreds of Labour Party henchmen and cronies are hand-picked to fill administrative, managerial and technical positions as persons of trust. These individuals are appointed without being subjected to a competitive exercise following a call for applications by the Public Service Commission or even assessed under the commission’s guidance to establish whether they are fit for the job. Taxpayer money is being squandered on the generous salaries and a raft of perks and fringe benefits that these privileged individuals are receiving. A handsomely-paid so-called person of trust is Neville Gafà, who had been described as the Prime Minister’s special envoy during a visit to Libya, where he allegedly offered money to Libyan nationals in return for accepting not to testify against him in court in connection with allegations he solicited money for the issue of medical visas, claims he has denied. Another person of trust is Clint Scerri who was deeply implicated in the Gaffarena property expropriation scandal that had cost the taxpayer €3.4 million. A third person of trust is Education Minister Evarist Bartolo’s former driver and canvasser, Edward Caruana, who is currently facing criminal charges in court for allegedly soliciting bribes from a building contractor who was doing some works for the Education Ministry. The civil service chief dismissed as a mere cultural matter the existing inequality of opportunity in employment in the public sector resulting from recruitment under the fake designation of person of trust. This form of recruitment violates the principles of fairness and justice and, therefore, to me, the only culture that it emanates from is that of corruption. Cutajar failed to fulfill the obligations imposed upon him in his position of head of the civil service when he ignored the injustices committed against the victims of this illegal system of employment. Despite possessing the required skills, competencies and qualifications for the job, these people had the appointments that belonged to them by right being given to Labour’s blue-eyed boys and girls. It is true that the unconstitutional practice of engaging persons in positions of trust outside ministerial secretariats started under the previous Nationalist administration, when even domestic staff engaged at the Prime Minister’s residence in Girgenti were recruited under the persons-of-trust procedure. But it is also true that this practice is diametrically opposed to Prime Minister Joseph Muscat’s solemn pre-election pledge of implementing meritocratic equality of opportunity. At the time of the previous Nationalist administration, Cutajar reasoned things very differently to what he does today. Back in 2008, he considered it to be manifestly unfair on him when he was stripped of his position of head, visitors’ services, at Heritage Malta. He argued that he should not have been removed from an office he was qualified to hold and did not console himself with the idea of a culture where a crony of the party in government would be given precedence over a staunch Labourite like him. Instead, quite rightly, he fought tooth and nail to prove he was discriminated against because of his political beliefs. Cutajar was eventually handsomely compensated for the injustice against him, to the extent of being given the right to enter into discussions with the government over compensation he estimated to amount to €17,800 a year. In contrast, the hundreds of Maltese citizens who have been denied merited positions in the public sector will have to endure the adverse consequences together with their families. For Cutajar, what was good for the goose under the previous Nationalist administration has not remained good any more for the gander under the present Labour government. He projects himself as some champion of justice through the setting up of grievances units to investigate injustices suffered by government workers under the previous Nationalist administration but, at the same time, he perpetuates gross injustices in his position of head of the civil service under the present Labour administration. Cutajar has failed to address the concerns raised by the constitutional law experts sitting on the Council of Europe’s Venice Commission who, quite rightly, consider individuals forming part of the public service without having previously undergone a selection process based on merit to be a danger to the quality of the service, which forms the backbone of a democratic state under the rule of law. He tried to play down the serious effects on the public service of this abusive recruitment practice by saying that the 700 public officers appointed through the persons-of-trust procedure (that is, about one-fortieth of the entire civil service) amounted to a “very small” number. 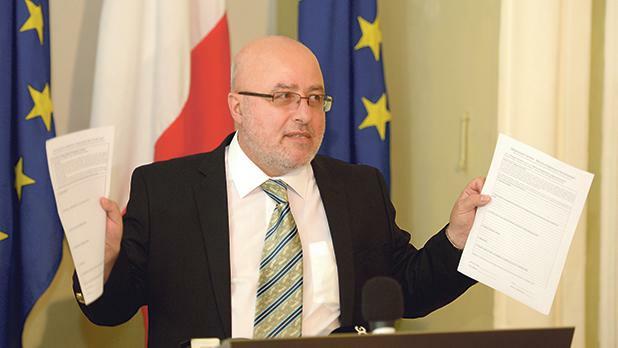 Cutajar, who was appointed principal permanent secretary by Muscat on the same day that he took office as Prime Minister six years ago, has played a strategic role in the execution of the former’s ambitious plan to take control of the country’s key institutions responsible for the proper functioning of democracy. On taking his position as head of the civil service, Cutajar demanded the resignation of permanent secretaries appointed under the previous government and pompously declared that it was a planned move and the right thing to do. However, Cutajar has not come up with the slightest shred of evidence of political partisanship by any of these officers in the course of duties. The siege laid by Labour on the senior level of the civil service continued with the intensification of hostile political control through the replacement of several other officers in headship positions who, in turn, formed part of carefully-selected public service selection boards that produced very dubious results, favouring particular applicants. There have been several occasions where Cutajar’s actions, or lack thereof, as head of the civil service have raised eyebrows. In March 2015, he remained passive when the General Workers’ Union, of which he formed an integral part for many years, benefitted from an unfair advantage over another trade union after the Office of the Prime Minister authorised Police Inspector Sandro Camilleri to be seconded on a full-time basis to a police trade union launched by the same GWU. This authorisation was given eight months before the union was eventually registered and despite the fact that the same union was ineligible to more than 20 hours of secondment a week on the basis of the 766 members it had declared for 2015-2016. In contrast, the other police union was discriminated against by being left waiting for the approval of a secondment despite having been fully registered at the time and eligible to a full-time secondment on the basis of its 1,225-strong membership. When Edward Zammit Lewis was tourism minister he found no difficulty to call upon Cutajar to have his permanent secretary with 40 years in the civil service removed from office. It is unacceptable to have a permanent secretary placed at the personal whim of a minister. This only serves to encourage a situation where such an officer finds himself obliged to concede to the minister’s wishes independently of their legitimacy. Just two weeks before the announcement of the last general election, Cutajar gave 10 working days to all government entities and agencies to transform hundreds of definite contracts into indefinite ones, in what appeared to be part of Labour’s desperate pre-electoral use of power of incumbency to win votes. However, when this newspaper requested a breakdown by entity of the number of public sector employees who had benefited from the mentioned directive, Cutajar refused to give the information and, when pressed by a freedom of information request, he came up with the lame excuse that the information is not held by his office. To be fair, here one should also mention that both before the 2008 and the 2013 elections, the Nationalist government had arrogated to itself a power that belonged to the Public Service Commission and went explicitly against the commission’s direction by granting an indefinite status to individuals who had been employed on a basis of trust without even informing the commission. The commission had objected to this and contended that the granting of such an indefinite status had been ultra vires and invalid in the first place. Both main political parties have much to answer for the culture of corruption that has caused unlimited damage to both the Maltese public service as well as to the country as a whole. Denis Tanti is a former assistant director (industrial and employment relations) in the Ministry for Health.